Yep! The sight had a noticeable uptick it workers this week -- things are heating up and going vertical. I've been snapping screenshots of the camera about every day (when I remember) and made them into an animated gif showing progress thus far. Thought I'd share. That's awesome! Thanks for putting that together and sharing it with us! KCLover wrote: I've been snapping screenshots of the camera about every day (when I remember) and made them into an animated gif showing progress thus far. Thought I'd share. I feel like this is a new screenshot. It is linked to from the architect's website. It is almost a replica of the one that appeared on CitySceneKC a little while back, other than the obvious time of day change. 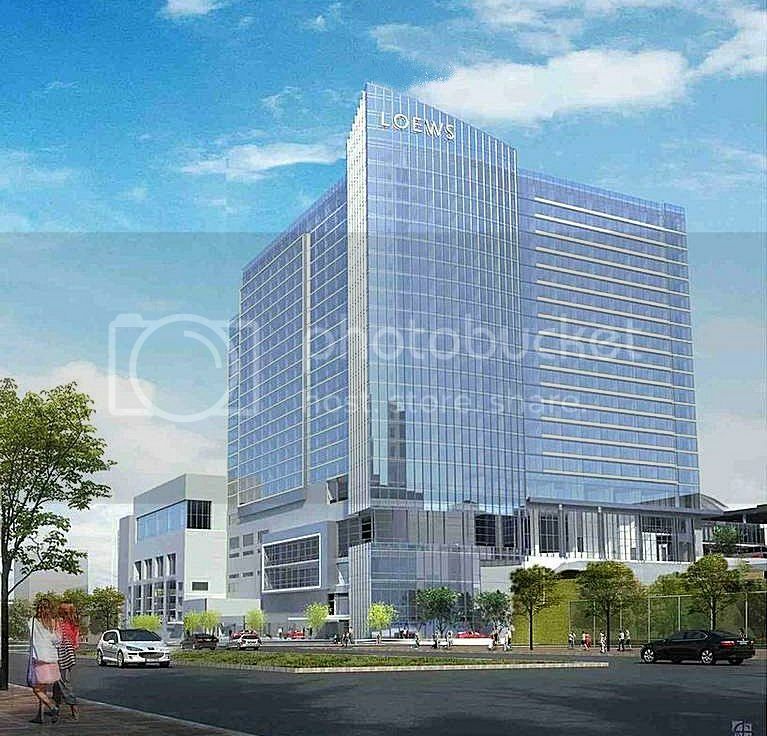 It shows the street level better though and the word 'Hotels' has been added under the 'Loews' at the top. Anyone see anything else? Last edited by KCDowntown on Mon Jun 04, 2018 1:00 am, edited 1 time in total. Looks like they refined the facade some too and added some detail to the north side of the windows upper floors. Looks exactly like the city council presentation deck last year, only change being the word "hotels." I feel for those folks staying in the Residence/Courtyard as the workers are now onsite from 2 AM on pouring concrete, etc.. Seeing the tower cranes coming in from I-70 heading west into DT, this is going to make a contiguous skyline from Bartle pylons to the KCPA. I cannot determine from going by the site or the web cam, but the western tower crane, is it to the north or south of the future western wing of the hotel? moderne wrote: I cannot determine from going by the site or the web cam, but the western tower crane, is it to the north or south of the future western wing of the hotel? Thanks. 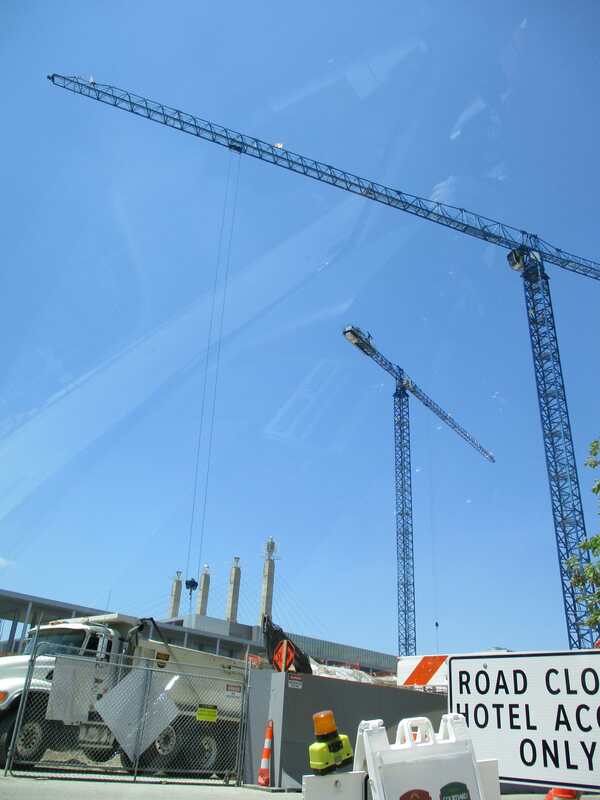 From the floor plans and the already discernible elevator shaft, the crane seems to be to the south of the west wing of the guest room "L."
In addition to a small army of construction workers from JE Dunn Construction and other contractors, Loews has 15 to 20 employees in Kansas City. Among the newest is Mark Champa, who began work Monday as director of sales and marketing for the hotel. Champa is a veteran of the Kansas City hotel and meeting business. Most recently, he was area director of sales and marketing for the InterContinental Kansas City at the Plaza hotel. He also has experience handling meetings and events for H&R Block Inc. and, as part of a third party, for Sprint Corp.
Tisch attributed early group interest in the property to Kansas City being a price-competitive market and the fact that people like shiny, new properties. Kansas City also is attracting interest because "people are tired of going to the same two to three cities," he said, and the city has plenty of attractions and amenities to offer convention and meeting attendees. Construction work is proceeding on budget and a bit ahead of schedule because of favorable weather. The official timeline, however, continues to show the hotel opening in the spring or summer of 2020. Woof...not a great start for them sales wise. Very tall columns being poured on site of former Hereford building. This will soon become very visible on the south, east, and west skyline. moderne wrote: Very tall columns being poured on site of former Hereford building. This will soon become very visible on the south, east, and west skyline. It's already making a positive impact on how the city looks from within the 670 trench. Too bad we won’t be able to see the city from the trench soon. Don't play with our emotions.